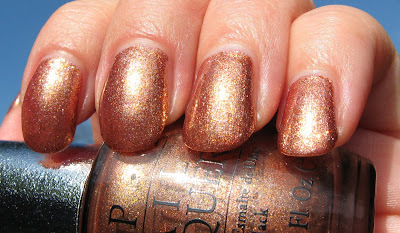 Above & Below: OPI's Designer Series in Glow. Above photos are outdoors in full sun, below are outdoors in shade with no flash. The glitter in this shade is quite intricate in it's componants and adds a definite twist of unique beauty to the overall look. Yesterday I posted about the new DS Mystery, and how although the polish shade itself was fine (a deep blackened purple with gold to olive gold shimmer), I was terribly disappointed that it didn't have the holo effect that DS polishes are known for. DS Glow doesn't have any holo effect either, but casting aside my hopes for a holo, I do think this too is a beautiful shade. 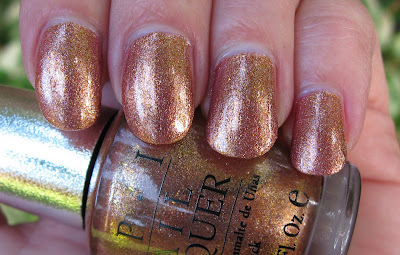 It's a coppery golden shade with an enormous amount of silver and gold glitter. I'll call it glitter rather than shimmer because the pieces are more defined and are different sizes and color, whereas a shimmer to me, is extremely fine, generally the same color as the polish, and all the same size. The glitter in this one lends itself to an extreme amount of sparkle, due to it's color as well as to it's cut. The silver glitter in the formula seems to brighten up the sparkle even more. 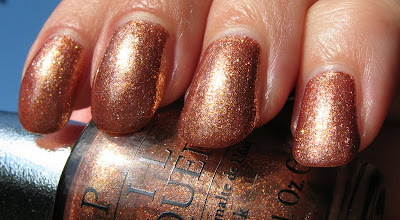 Both of the new DS shades are fairly unique and most definitely pretty, but if you're hoping for a holo, you won't find it in either one. They are similar in application to the other DS polishes I've tried, in that they have a smooth application and are opaque in 2 coats, with quick drying time. I love this one and I also don't mind that it's not a holo. This is more like it! I will gladly buy this one. Looks beautiful on you. Just such a glorious colr and glitter. It's so coppery I love it! 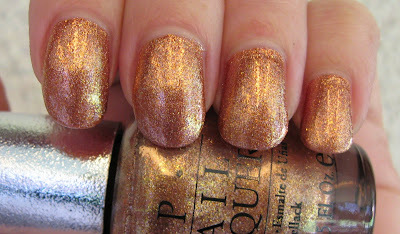 I want OPI to start making DS Holos again.I like the glass flecks,but the holos are even more stunning. 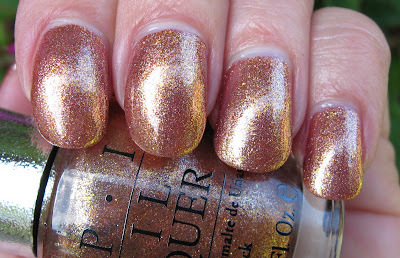 Nicole~I didn't mind either that it's not a holo, because the shade is so pretty! Maestra~no compaints from me, I love this shade and the way the finish looks. Lucy~I love this one too. THey all have the diamond dust formula, which I assumed is what gave them the holo look, but I guess not. Still very pretty. AllYouDesire~very pretty, I agree. The publication I have with the ad for these says "...for ultra-rich, glimmering, dimensional color" but even though it's not dimensional, it's still lovely. Valerie~me too, but this is a nice shade at least! Pinkginger~I'm still a little confused as to why these don't have a holo, because I still think all of the DS polishes are supposed to be that way! Diana~I liked Mystery too, but this one redeemed itself by being so pretty!